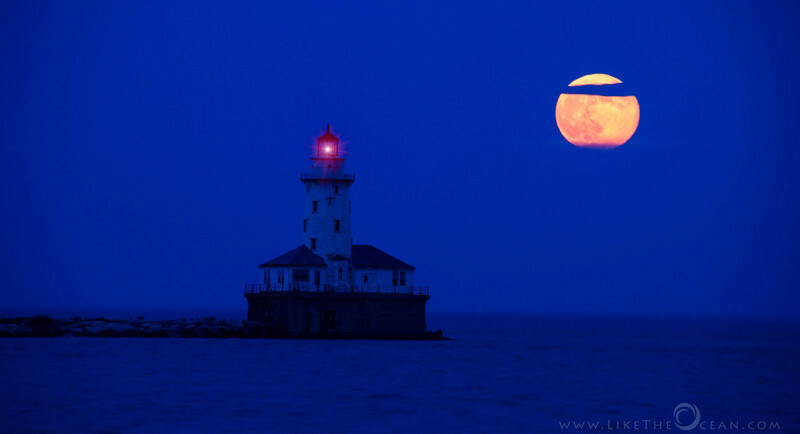 Super moon, Blue moon, Pink moon, Harvest moon – are all nothing but whimsy media terms. Believe me, there is nothing super about the super moon. I am definitely not an expert at shooting the moon. I have captured the moon in the past, but am still learning. One thing that helps in getting a captivating shot is to capture the moon when it is low - real low - on the horizon. The other is to include a foreground subject to get a scale of reference. Just make sure you far away from the foreground subject and shoot with a really really long long lens [ beg borrow or steal, just get the longest lens you can :) ]. Shooting with the long lens helps actuate the size of the farther object (in this case the moon) by playing with your mind. As with the below shot or this example of the sunset. It becomes much more obvious in this shot by Photographer Alessandro Della Bella. This evening the weather was playing hide and seek. It was supposed to be clear. Then it was all overcast. After lot of deliberation, decided to drive out to the planned spot. It was still an hour or so more for the moon to come up. It was still drizzling. Decided it would be a nice evening walk, if not anything else. Just around the time of the moon rise, the clouds had cleared a bit, but the the horizon was still overcast and hazy. What is the fun if everything goes as planning right :) After suspenseful wait the moon decided to show up – just at the right spot. At the end it was all worth it. Yes - there is nothing super about the super moon. Actually - every full moon is indeed super. What do you say ?!! !